Every Friday night, I go to the local yarn shop and knit. I do it mostly for the community (because God knows some days I don’t feel like knitting and I go anyways). The friends I’ve made at this place are the solid kind of friends that you know will be happy to spend time with you even if you just want to curl up in a corner and face the wall and not talk to anyone… and usually, if I show up in that kind of mood, I still leave the happiest I’ve been all week. Sometimes, people show up with food to share. (I should probably do this sometime…) One week, the food was a candy-like concoction from a local bakery. The best way to describe it would be a granola brittle, that was far more granola than brittle. Since buying it online was very expensive (the cheapest option cost around $40 plus shipping) and I didn’t know where to go to buy it, I decided to try to replicate it. The basic process for each of these was the same. Make a brittle, add granola, cool, eat. However, the results were somehow very different. 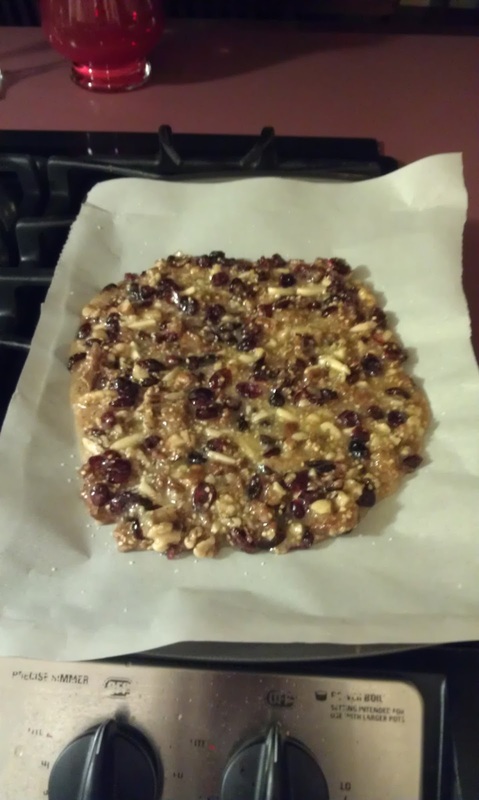 This was my first attempt at making brittle ever. I didn’t imagine it would be too hard, and it wasn’t… in both senses of the word. After reading a ton of brittle recipes and the ingredients list on the product, I came up with a seemingly simple process: heat sugar and honey until it reached hard crack stage, stir in butter and cream, stir in granola. Problem: not only was I completely guessing with my proportions, I also discovered that nobody agreed on what “hard crack stage” was. The temperature associated with it ranged about 75 degrees, which is a lot when you’re working with something this finicky. I trusted my candy thermometer. My thermometer was wrong. I also probably added too much butter and cream. Needless to say, my brittle was one of the most ductile candies I’ve eaten. However, it was quite delicious. Not sure why I don’t have a picture of this… this one really didn’t turn out well. It was very… grainy. This could either be my attempt at adding oatmeal (instant oats), but more likely is because not all the sugar had melted when part of it had reached a much higher temperature than hard crack stage. So… even though it was hard, and tasted fine, the texture was just… disappointing. After guessing that the strange texture of the previous round was due to improper amounts of stirring, I decided to try something different this time: remove the thermometer. After realizing that it not only didn’t really help me understand what hard crack stage was, but it also was a major obstruction to the stirring process, I decided that maybe I would do better without it. Unfortunately, this batch also included sunflower seeds, which, while in the original product, somehow took away from the taste of the brittle when I made it. Soooo my plan had been to keep experimenting and keep posting until I had finally obtained a good brittle, but at some point this plan lost steam. I made one more batch after this, which crystallized but never hardened, and ended up being trail mix and sugar mush with the texture of a caramel gone bad. This was, for obvious reasons, very difficult to eat. 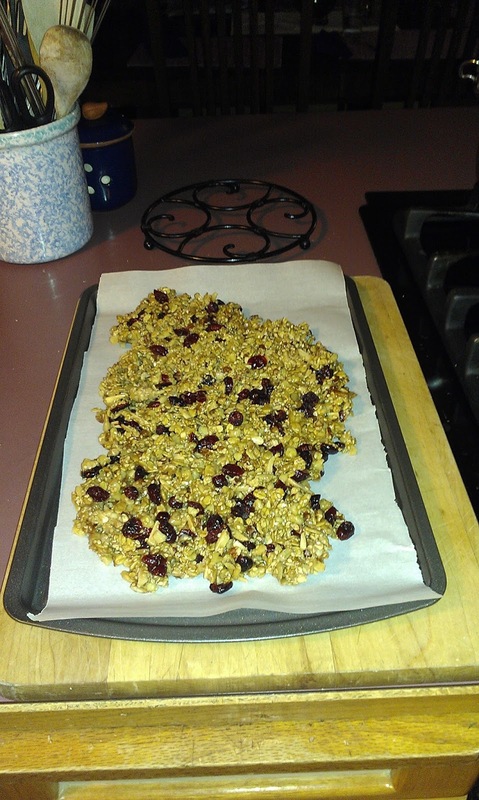 I had a successful run with a bacon brittle a while later, but haven’t gone back to trying to make the granola brittle that I wanted. In the interest of keeping the blog posts flowing, I’m retiring this project for a while and letting y’all know how the first 4 attempts went. When I’m more experienced in candy making, I’ll come back to this, I’m sure. I have better equipment now, so the candy experiments should be coming soon. mcooledge on I made birthday cake Oreos? Julie on I made birthday cake Oreos?